----We live in a marvelous time.Our grandparents cruised using sextants and calipers. We use RADAR and GPS. But even with this incredible technology, there is a simple requirement true for any level of technology: know how to use it. -----Halcyon has a flattened dome atop her cabin. Inland, on the lakes and rivers, most folks think it is a fancy TV antenna. One chap, a guest on a 57-foot yacht towering over us in an adjacent marina slip, thought our grandkids Frisbee had lodged on our cell 'phone antenna. After several sunset libations, we tell inquisitive folks it's a perch for gulls. 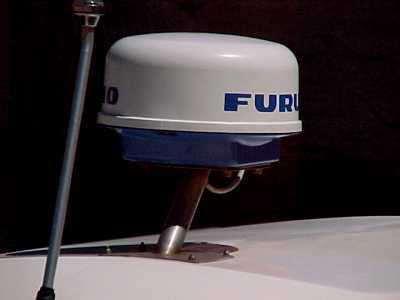 Our salt-water friends think we put the radar dome up there simply to have good laughs over the comments we hear. -----Most folks know that radar was a marvelous military breakthrough used with varying degrees of success in World War II by naval vessels. Some may realize that radar helps guide airline pilots on their flights. We had a friend who was a navigator for a major airline. Early in his career, he sat, cramped and cold, in a Plexiglas dome atop his Constellation, shooting the stars with his sextant on flights to Hawaii. If it wasn't too cloudy or turbulent, he could put his flight somewhere near the islands - close enough that he could range to the airport by homing in on the signal from a local country/western radio station. Before he retired, he was navigating by satellite signals and radar. -----Technology has become everyday. Mom finds her way to the beauty shop using Global Positioning Satellite transmissions picked up by a receiver on her dashboard. Her kids do Geocache games on the weekends, searching for hidden 'treasure' using the same transmissions received from satellites by small hand held receivers. Yesterday, our son gave us a radio the size and shape of a credit card. -----Compact everyday technology has revolutionized small boat cruising. We can, on our little 22-footer, use the same software and instrumentation that guides QEII or a 747. That little squashed dome on our cabin roof - you know, the gull perch? - it gives us eyes in the dark, fog, and rain. 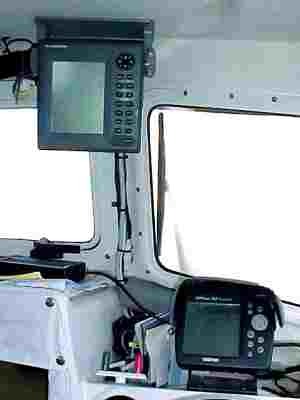 The little box on our dashboard - labeled GPS Chartplotter - displays our location on nautical charts. It tells us the depth under our hull. It knows the tides at the closest tidal station, the distance, and direction, to the nearest rest room or restaurant, and even the water temperature. -----Amazing - we can fill that little box with all the charts from Prince Rupert to Skagway. Then, we can plot our intended routes and anchorages into the chartplotter. Voilà - day or night, rain or shine, fog or clear we know within a few feet of where we are, what direction we need to steer to stay on course and how long it will take us to get to our next sundowner. With the radar antenna swinging inside the "gull perch," we can even see through the foul weather or dark to be sure there are no ferries, container ships, or (hopefully) icebergs along our course. If the Titanic had the technology we have aboard our 22-footer, she would be afloat today. -----Now, all this sounds great. One might imagine covering the windscreen with a blanket and navigating perfectly to the closest cheeseburger, even though blind as a bat. You know, we've all read of pilots taking their instrument landing exam, with a black curtains over their windscreens. They come in on a perfect three-point landing. Well, on a boat, our advice would be - Don't try it! First, Halcyon doesn't have three points. Second, there aren't many cheeseburgers on the Inside Passage. Last, but certainly not least, both you and the instruments have to be operating flawlessly. We know how perfect computers are, and when was the last time you could claim perfection? -----Let's visualize the situation. You are cruising northerly. Well, you think it's northerly. Last night, after a sundowner, you plotted today's route. After a sundowner is not always the optimum time to do the plotting. -----The day started out clear and bright, but now there's a dark fold of clouds low on the northern horizon. You remember NOAA weather radio saying something about "an upper level low," whatever that is. You soon find out, as you are enveloped in darkness. The wind moans at 35 knots under your radar dome and the calm sea is soon a bunch of heaving, foaming speed bumps six feet high. It is all you and the admiral can do to keep your seat - your arms flail like the buckaroo on the Brahma at the Calvary Stampede. Not to worry - the chartplotter looks calm and says you are on course. You flick on the radar switch so you can "see" through the smeary mess on your windshield. You press POWER and it begins a sixty-second countdown while it "warms up." That's the longest minute of your life, as spray and spume crash over your bow and you fight to hold the wheel in your hands. Ah, it reads "standby" - but there's no picture. Now what? "Should have practiced with the darn thing back when it was calm," you think. "But didn't need it then," you conclude. 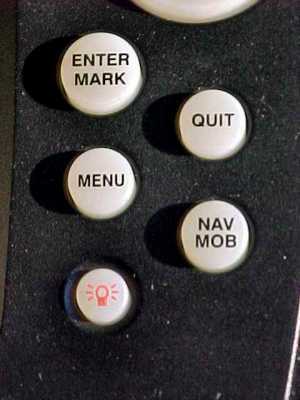 -----Let's see … lots of buttons … which one? ----- Ah, MENU - that sounds like the place to start. A confusing array of choices is presented … can't figure any of them … there isn't a "turn on" choice anywhere on the list - and a warm comfy bed, home on the farm, isn't an alternative, either. 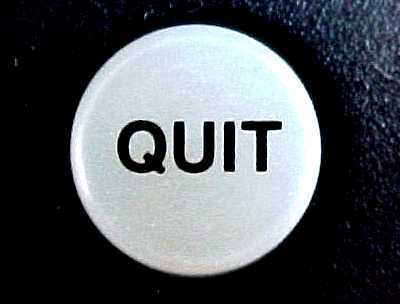 ----- OK - let's see what these other buttons read: EBL - Early to Bed, Late to… NO, Not that one! VRM - don't need any vrooming now. There's a minus sign and a plus sign, but pushing those neither increased or decreased anything on my blank screen or in the mess outside. Ah, GAIN - now that's an idea, but gain what? Sounds better than loss, but nothing happened. STC - sounds like one of those drugs the government warns about. FTC - Federal Trade Commission? Just what we need, a federal bureaucracy. What do those yahoos know about the sea that I don't know? NO - Don't answer that question? 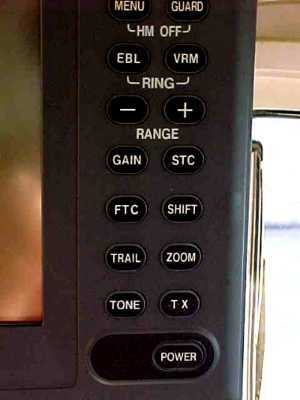 SHIFT - TRAIL - Can't see what shifting or trailing is going to do for us now. ZOOM - Geeze, going fast enough now. 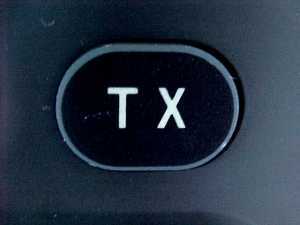 TONE - I'm a fine shade of gray right now, so maybe if I push that button I can go white? TX - Don't know what the Lone Star can do about this situation, but then, we've had several Presidents from TX who seemed to think they had the right answers to everything. So, I'll push it … GADZOOKS - the thing lit up. Nothing like a little assist from TX. -----But now what? Lots of black squiggly lines and dots - ah well, through all that time playing with the gizmo, the front has passed, the rain stopped, and the waves are settling back down to something resembling the feeling in my stomach. ----- Later, in the marina pub, a fellow tippler says to me, "You were out there today? What was it like?" -----"Oh, nothing much," I answered, swallowing another giant gulp of Old Hickory. "We have all the technology aboard. It's incredible. Everything was calm and beautiful. Then I started playing with the RADAR. How was I to know that would stir things up? Soon we were Roaring Around, and it was Dark And Raining. If you have a RADAR, don't fiddle with the thing." -----"Ah, but then the tech fix - a miracle - on the GPS - you know, the Great to Prevent Stuff device. It has lots of neat buttons." -----And, you know, within moments the wind slacked and the sea calmed. Ain't technology great?" - and we both drank to that!